Interested in moving your students towards meta-cognitive thinking during their independent reading time? Want them to dig deeper when making connections to and within the text? Then look no further! 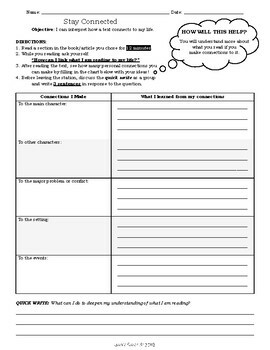 Download this graphic organizer and use it as either a whole-class handout with a mentor text or as a station activity for an independent reading group. The chart will help support your students' process of making connects to the text from theirs lives and within the text.